I'm old enough to remember East Berlin: Ostbahnhof, Lichtenberg, Ostkreuz… OK, I mostly remember the train stations east of The Anti-Fascist Defense Wall, but so what? You weren't there at all, where you now? I admit that I'm not old enough to remember the Donovan-Abel-Pryor situation, though. Apparently, liberties were taken with the material, but then, it's (East) Hollywood, folks. 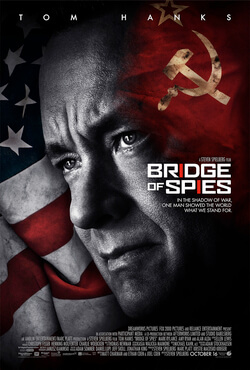 I like the Cold War feeling, but sometimes “Bridge of Spies” is borderline comedy (think “Charlie Wilson's War”, also featuring one Tom Hanks). Somehow, however, it works. I first wanted to give the film four stars (cuz reasons), but after some negotiations with a mysterious private citizen, I give it five!